If you're not making money with your website despite of the steady increase in the number of visitors, you need to investigate the negative factors. Google Analytics can confirm "what" (i.e. the facts such as popular pages, bounce rates), but not "why". 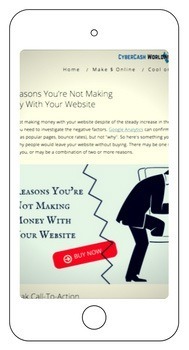 So here's something you should know - reasons why people would leave your website without buying. There may be one reason that applies to your site, or may be a combination of two or more reasons. ​The sentence with a link is not at the end of the article but half way the article. You don't conclude with your promotion, means you're not asking your reader to even consider a purchase before they leave. The phrase is not a request to buy; for example "Click here to take a look" instead of "make a purchase". Call-to-action should be big, bold and clear. Adding a button to your webpage makes a big difference. Using a free Call-To-Action Button Generator is a good idea. Thrive Content Builder has an awesome CTA feature such as the image shown here. 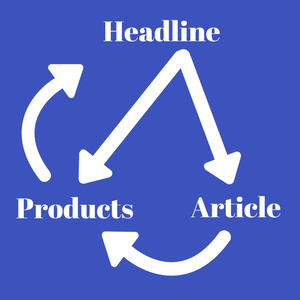 Headline (page title) is the entrance to your blog post. That's what people find by organic search. Headline decides what kind of audience to invite, therefore it's important to choose the right keywords to find potential buyers. A headline "Keep Your Leather Jackets Last Long" and relevant article may be informative, but that would only be likely to find people who want to know how to take care of their jackets, not those who are wishing to buy a new jacket. But you may be able to promote leather polish within that page instead. A headline "Long Lasting Leather Jackets" may invite people who are prepared to buy good-quality jackets. This means every time you decide the headline of your page post, (a) your intention should always be clear - whether you're trying to sell or giving advice to your readers, and (b) If you're giving advice but promoting some products in the same page, make sure there's a connection in between the headline, article and the products. It is so tempting to appeal that there's so much you can offer​. Social share buttons, affiliate banners in your sidebar if you have any, footer menu, and even your top menu. However every link is an "exit" - whether internal or external - ushering visitors out of the page. On top of all the "exits" that you may already have in your site, by placing more links in the blog post, you're only giving your visitors more opportunities to leave. I'm referring to "by-the-way links" as a bad example here. Throughout your article, alongside the "Buy Now" button link, you carry on "By the way, if you're looking for XYZ, click here. We also have ABC, click here. If you want to know more about DEF, click here..." These are all distractors and alternative exits. One of the "golden rule" of an online sales letter is to have only one exit, i.e. "Buy Now" button. And it should be placed several times in the page if it's lengthy. No side bar, no menu bar. But a blog like yours and mine is not a sales letter, we're not hard-selling. In niche marketing, we're giving information and advice to our readers, hoping they'll appreciate and make a purchase in the end. So I'm not saying you should only have one exit (link), I'm saying the number of links in your article should be minimised. This is often a dilemma. Generally the longer your blog post is, the more refined information will be picked up by Google, hence you have a higher chance of ranking well. We are often advised to write at least 750 words - 1,000 words per blog post. The good news is when a product itself has many features and needs a lot of explanations, your article will be inevitably lengthy anyway. The bad news is people are too busy to read. They want to read less, and digest as much information out of fewer number of texts. Ultimately they test your article to see if it helps them to make a decision; buy or not to buy. Lengthy and complex article can scare them away and, that may be one of the reasons you're not making money with your website. A long blog post can be segmented by more headings and fewer sentences in each paragraph. Call-to-action button should be placed several times throughout the page, say one at half-way down from the top, another one at 2/3 down, and one more at the end of your post as a conclusion. ​Images placed in above-the-fold (top half of your webpage) will indicate what the page is about instantly, telling your visitor whether they're in the right place or not. It's much harder for your visitors to digest the content only by reading plain texts. 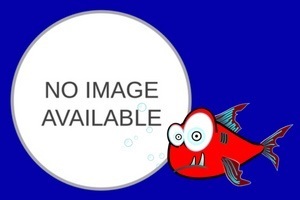 A blog post with no image display is visually bland and boring. People tend to scroll down quickly until they see an image, and if there isn't any, there's a greater chance for them to leave your page without reading, let alone making any purchase. A product comparison page is great in helping visitors to make a decision to purchase. What you need is to display several products but not too many, with a clear indication of advantage and disadvantage of each product. Typical example would be something like "Design 7/10, Usability 9/10, Features 8/10... Overall rating 8/10" with detailed explanations. Your visitors may get confused or bored if they see too many products in one page. But how many is too many? It really depends how the products are laid out and the similarity between the products. But they should be laid out in clear order with relevant images attached. The last thing your visitors want to hear is "By the way, there's another product here...and here...and some more"! You only start reading an interesting article and this giant ad pops up in your face​. Your annoyance level is maximum when you can't find the [X] to close, or when you've accidentally clicked the ad to open a new window. You immediately close it and uncover the article that you were reading. Not just irritated by it but knowing the fact that the whole advertisement's been wasted... The moment you accidentally clicked and closed, the advertiser would have paid a few cents ppc (pay-per-click) to the agent for nothing. People hate popups that don't offer any value. Such as the ones that repeat the same offer in the same popup, or the ones that generate a new popup each time the user clicks "no thanks". With all that said, popup ads are proven to work - if they didn't work people wouldn't use them. Clickmagick suggests that many of their users have been able to increase average EPCs (earnings-per-click) by up to 42% using their popup feature. Placing clickable advertisements (popups, banners) is a tremendously good idea to redirect your visitors to a product page. But if they're not clicked, obviously they're not effective. Change the ads (e.g. design, size) or their position, or get rid of them completely. Even worse if they're scaring your visitors away (i.e. they leave the page). Means the ads are only annoying them, not good enough to interest them. 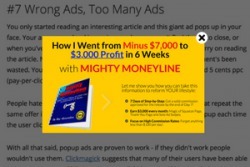 Too many ads across your blog post will equally annoy your visitors. Heatmap Tracker is a great tool to monitor your visitors' movements, enables you to check at what point your visitors tend to leave your site, e.g. as soon as an ad pops up. "40% of people abandon a website that takes more than 3 seconds to load." I'm not sure where that statistic originated, but if you Google search by the exact sentence, you'll find that it's mentioned in many sites. So keep in mind that visitors will not tolerate a few seconds of blank screen, unless your blog post has a reasonably enticing headline. Mobile responsiveness is now crucial. You can make sure your website is "officially" mobile friendly from Google Developer's tool ("Is your web page mobile friendly?"). But the tool does not detect if your call-to-action button is in the "wrong place". It's best to check it all yourself; access to your website using your own mobile device​ and ensure everything's fit in the small screen. The call-to-action area should be clearly noticeable, and the buttons are actually clickable. Design as in the look of it, and also design as in usability and accessibility. Old-fashioned ​looking website itself is off-putting. If it was created using an outdated editor, the site is probably poorly navigational, slow loading and mobile-unfriendly too. The CMS (content management system e.g. WordPress) that you're using should be the most updated version. Old versions can prevent users from accessing some features because of the script that's obsolete. You should be using the latest theme and plugins that have been tested by the provider on the new version of the CMS. At the end of the day, outdated website makes the visitors hard to find the value in it - unless there's an outstanding uniqueness, such as a very unique niche, or extremely interesting content. That may be one of the critical reasons that visitors would leave without making a purchase. As a user, you get pretty disheartened when you're all prepared to buy but discover the purchase link is broken. As a marketer it's even more damning when you discover you've missed out on sales opportunities because the link's been broken for a while. So maintain your links periodically! It would be hard to check every single link in your website page by page, but there's a free plugin available for WordPress such as Broke﻿﻿n Link Checker. ​Sounds obvious and silly, right? But believe it or not, this is a conversation I had in the past with two of my fellow affiliate marketers. Affiliate A: I was wondering why I wasn't making a cent, and realised I had forgotten to add an affiliate link in many of my blog posts. Affiliate B: Yes, it's important to always remember to place​ a link. Ray: What do you mean you've forgotten? Ray: But as an affiliate, your ultimate purpose of building a website is to monetise it...? Affiliate B: I tend to get carried away with the content I'm writing. As soon as I finish, that's enough and I publish it forgetting to include a link. Don't forget to place a clear call-to-action! If you feel you're not making enough money with your website, I hope you'll make some improvements by avoiding the 12 points listed above. Feel free to leave comments or questions below. Create your own beautiful website, learn & earn. Join the Wealthy Affiliate Community of over 800,000 Internet Entrepreneurs!